Many folks in eastern Ontario have seen huge white birds either flying or on the water. Those really huge white birds are Trumpeter Swans. Trumpeter Swans were more common here at the time of European contact. But such grand packages of roastable fowl did not last against the hungry settlers and trappers. They were shot for meat but also for commerce. The Hudson’s Bay Company bought Trumpeter skins to sell in Europe for powder puffs, quill pens, trim for clothing and for fine leather purses. The very last Trumpeter was shot at Long Point on Lake Erie in southwestern Ontario in 1932. Early endangered species considerations in 1979 prompted the Ontario Ministry of Natural Resources to begin thinking about restoring the Trumpeter Swan population. Just before his retirement as a District Biologist, Harry Lumsden, who had been fascinated by waterfowl since his youth, focused on the goal of restoring the Trumpeter Swan population to Ontario. Harry Lumsden served as the District Biologist in Tweed district for several years. The first step in the restoration was a shipment of 23 eggs from Alberta where the western population had not been extirpated. Harry Lumsden found 23 volunteers who owned ponds and were willing to care for and overwinter swans. He hatched the Alberta eggs and supplied cygnets to 23 foster homes. 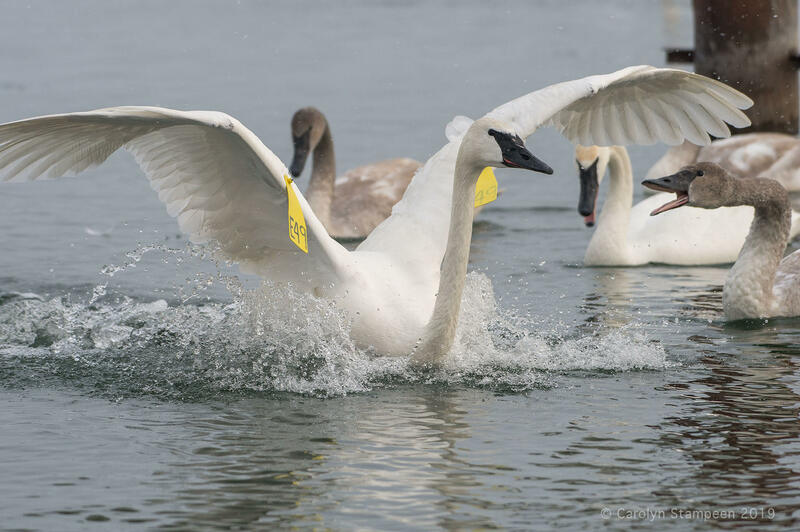 Over time, volunteers working with Harry Lumsden released 540 Trumpeter Swans in Ontario. 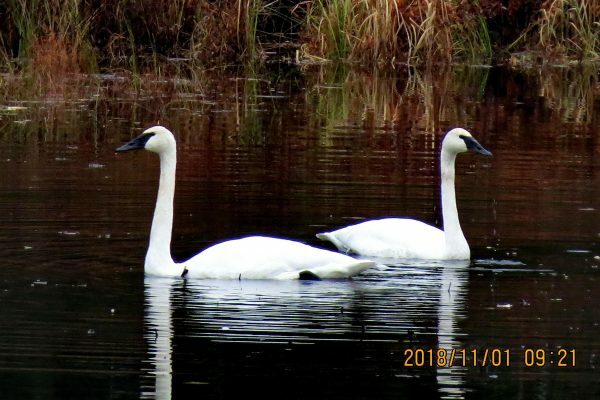 The volunteers have formed the Ontario Trumpeter Swans Restoration Group and continue to aid the Trumpeter’s restoration (www.trumpeterswansociety.org). Read more about restoring swan populations here. Some released swans have nested and raised young. Trumpeter Swans are the largest swans in the world with wingspans reaching 8 feet. Trumpeters may be the heaviest bird capable of flight. They build huge nests, up to 3 metres across. Often they nest on top of old beaver lodges, building a nest of aquatic plants and, in so doing, clearing a moat around the nest. They also will use other objects to support the nest and will even build on man-made rafts. They don’t seem bothered by normal human activity. Trumpeters do not reproduce until at least 5 years old and commonly much older. Pair bonds are very long-lasting and nest sites are commonly re-used. With such a late age at first reproduction, overharvesting could have easily extirpated populations. Reproductives lay 4 to 6 eggs that hatch after about 30 days. Cygnets soon swim and expose themselves to predators such as snapping turtles. Fledging takes more than three months. Commonly only two survive until winter. That just replaces the parents so any population growth depends heavily on longevity as well as full reproduction. In all of southern Ontario, in September 2006, there were 776 Trumpeters. 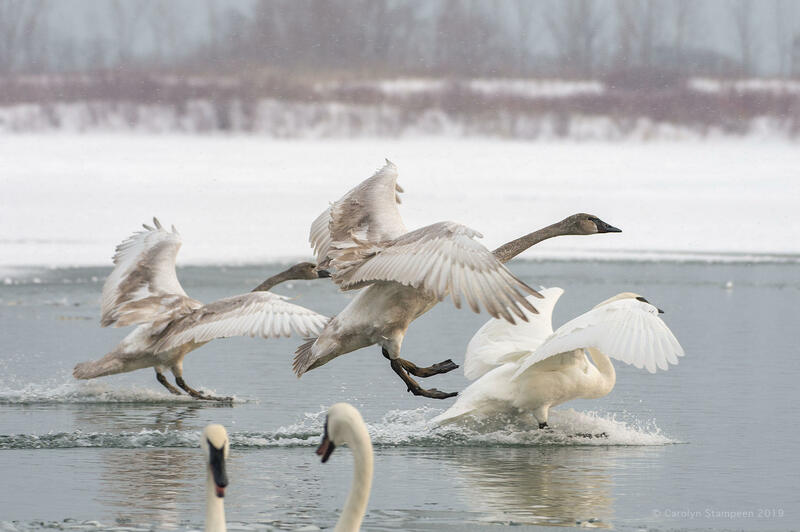 By 2010, there were about 1000 Trumpeter Swans back in Ontario. Significant numbers were nesting and we commonly see the grayish young in late summer and early fall as they move around with the parent birds before winter. 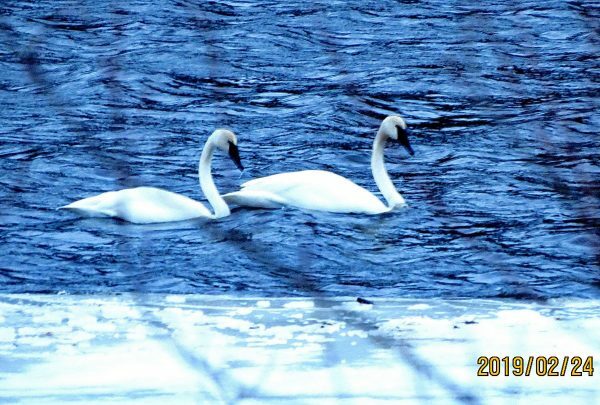 Trumpeter Swans do not migrate south. They aggregate in open water on the lower Great Lakes and on some large rivers. Often they are in mixed flocks that include Tundra Swans and Mute Swans. Tundra Swans’ bills are all black. Mute Swans are invasive, non-natives that have escaped from swan flocks in urban areas that were imported from Europe. They have a red and black bill. They have bred widely around the lower Great Lakes, their population is increasing rapidly and they compete with Trumpeter Swans for nesting habitat. Tundra Swans are native but nest only in the north. We see them as migrants. They may be distinguished from the Trumpeters by a variable yellow patch between the bill and the eye and slightly smaller size. Trumpeter Swans are grand birds to encounter, especially when they take off and spread those huge wings over you. They can be seen in many places in eastern Ontario. At summer’s end, large numbers occur on the Crowe River near Marmora, on Consecon Lake in Prince Edward County, in Lake Ontario off Kingston and in lesser numbers in breeding habitat in the inland rivers and lakeland across eastern Ontario. Thanks to Harry Lumsden and his volunteers they are one of our most valuable natural riches. Lumsden, Harry G. Mute Swan, Trumpeter Swan, Tundra Swan pages 274-277 In: Black, John E. and Kayo J. Roy. 2010. Niagara Birds. Brock University.